Fall Leaf Tiffany Style Table Lamp - Crafted to resemble leaves in warm fall colors. A beautiful Tiffany style accent lamp with an elegant art glass shade designed to resemble fall leaves. 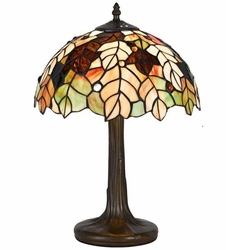 This beautiful Tiffany style accent lamp features a handsome art glass shade. The shade is crafted to resemble leaves in warm fall colors. It stands on a zinc cast base, and comes in a dark antique brass finish. • Tiffany style art glass shade with leaf motif. • Maximum 40 watt or equivalent bulb (not included). • Shade is 12 1/4" wide, 6 3/8" high. • Base is 7 1/4" wide.